If today’s credit crunch has historical parallels, they are closer to nineteenth-century “normal crises” like 1837, 1847, or 1857. In those panics, financial innovation caused uncertainty and nervousness, but also induced an important and beneficial learning process. The financial institutions that survived the crises went on to play a crucial role in pushing further development, and they had enhanced reputations because they withstood a crisis. Sometimes monetary and fiscal authorities have an obligation to ignore the wilder historical parallels and look at a broader picture. Sometimes, too, the best response to a crisis is this: don’t just do something; stand there and do nothing. James, incidentally, once coauthored work on financial crises with some guy named Ben Bernanke. But, he said, “I visualized my grief if the stock market went way up and I wasn’t in it — or if it went way down and I was completely in it. So I split my contributions 50/50 between stocks and bonds.” As Mr. Zweig notes dryly, Mr. Markowitz had proved “incapable of applying” his breakthrough theory to his own money. Economists in his day believed powerfully in the concept of “economic man”— the theory that people always acted in their own best self-interest. Yet Mr. Markowitz, famous economist though he was, was clearly not an example of economic man. I don't claim to be any better at asset allocation than Markowitz was. I take some comfort in the fact that I am not too far from the recommendations of David Swensen. Friedman’s association with Gen. Augusto Pinochet, the Chilean dictator, was indeed the worst stain on his career. His defense that his economic advice to Pinochet was no different from what a doctor might give a government on how to deal with an outbreak of AIDS is not very persuasive. The problem is that the reviewer fails to then explain why it's not persuasive. He seems to assume that the explanation is obvious. But to me, it is not obvious at all. Similar, but somewhat less emotionally charged, ethical issues arise in the context of advising democratically elected leaders. For two years, I worked as an adviser to George Bush. Now I am an occasional, unpaid adviser to Mitt Romney. To my constant surprise, some letter writers and some commenters on this blog presume that I must agree with, or be responsible for, every position they take. That is a deeply silly assumption. Presidents and candidates have to make decisions on a multitude of issues. It is unreasonable to expect any adviser to agree on every single issue. Indeed, politicians listen to many advisers with different points of view. An adviser cannot resign in protest every time a decision fails to go the way he advised. The system could not function if people acted in such a self-centered way. Consider: Should an economist who believes abortion is murder refuse to advise Barack Obama on tax reform? If this economist chooses to become an Obama adviser and Obama wins, is she then complicit in all the abortions that result from President Obama's pro-choice policies? If her advice on tax reform is only partially followed, should she resign her position as adviser? If she continues as an Obama adviser, is she then responsible for all policy positions that Obama takes? Is she even responsible for Obama's tax-reform proposal? My answers are NO, NO, NO, NO, and NO. In my view, the adviser is responsible for the advice she gives, and Obama is responsible for the positions he takes. Maybe I am being too easy on economic advisers, like Milton Friedman, myself, and my hypothetical Obama adviser. But I worry about what happens when sanctimony leads people to put too high of a moral "tax" on advisers from academia. Most academics avoid politics altogether, preferring the relative comfort and better compensation of life in the ivory tower. The uglier the world of politics becomes, the fewer academics will venture forth with their input, and the poorer everyone will be as a result. 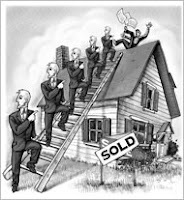 Princeton economist Alan Blinder writes about Six Fingers of Blame in the Mortgage Mess. Why has the great divorce myth persisted so powerfully? Reporting on our families is a lot like reporting on the economy: statistical tales of woe provide the foundation for reform proposals. This seems to be an example of what Bryan Caplan calls " the pessimistic bias, a tendency to overestimate the severity of economic problems and underestimate the economy’s performance in the recent past, the present, and the future." The Boston Federal Reserve Bank is aiming to become the regional Fed that emphasizes behavioral economics (the oddly named subfield that emphasizes the intersection of economics and psychology). This past week, I attended a conference there on the topic. The big problem with U.S. fiscal policy is that, over the years, politicians of both parties have voted for unfunded entitlements for the elderly, which will (unless scaled back) result in substantially higher taxes on future generations. Click here for my views on the problem. How might this be funded? There are only three groups that could be asked to pay for the new entitlement with higher taxes (or lower benefits): the current elderly, those currently of working age, or the same future generations who are getting the new benefit and are slated to pay for existing unfunded entitlements. Which group do you think Senator Clinton has in mind? If any of my economist friends involved in the Clinton campaign wants to email me the answer and, more generally, the rationale for this idea, I will gladly post it for my readers. While there are 74 Forbes 400 members who inherited their entire fortune, 270 members are entirely self-made. The political issue of the hour is the debate over expanding SCHIP, the State Children's Health Insurance Program. The Washington Post calls it "the biggest domestic policy clash" of the Bush presidency. Find the answer here. Scroll down to Figure 1. Thanks to reader John Dewey for the link. Update: David Brooks on the SCHIP debate. A contribution from guest blogger Tobin. GMU economist Bryan Caplan summarizes The Four Boneheaded Biases of Stupid Voters. Check out the latest issue of the JPE. A new survey by Mishkin. How big a problem is lack of health insurance? You base your healthcare proposal on the need to cover 47 million "uninsured Americans." Since about a third of them are illegal immigrants and another third are eligible for Medicaid right now and just don't apply for it, aren't you overstating the problem? His one-third figures seem a bit high to me, but he is right that 47 million substantially overestimates the magnitude of the problem. A serious estimate would take out both illegal immigrants and those who are eligible for Medicaid but have not applied. Those eligible for Medicaid can always enroll once they need significant medical care. What is the right figure for the number of Americans who do not have access to health insurance? I don't know, but it is much less than 47 million. If anyone knows of a reliable estimate, let me know. * See the Economic Report of the President, 2004, page 197. It sounds like Philadelphia Fed President Charlie Plosser is not inclined to cut rates much further. David Leonhardt describes the latest in happiness research from economists Alan Krueger, Betsey Stevenson, and Justin Wolfers (all of whom have PhDs from the Harvard economics department). The perils of an unusual name. Jim Hamilton, one of the most astute macroeconomist-bloggers, provides this great graphic. It shows forward inflation compensation during the market trading of Tuesday last week. This measure is based on the spread between nominal bond yields and real (inflation-protected) bond yields. It reflects the market's expectation of future inflation--to be precise, the expectation of the average five-year inflation rate starting five years from now. Click through to the Hamilton link for more details if you are not familiar with this sort of data. 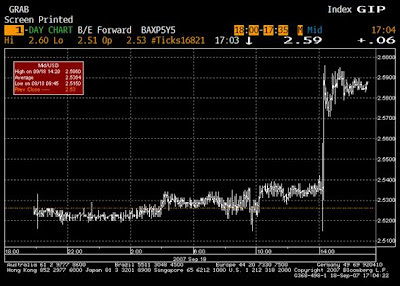 The jump upward at 2 pm occurred just after the Fed's announcement of a surprisingly large cut in its target interest rate. The apparent change in expected inflation is not large--about 5 basis points--but it is striking nonetheless. It shows clearly how easier monetary policy raises expected inflation. I do not want to cut benefits or raise the retirement age. I believe there are a number of ways we can make Social Security solvent that do not involve placing these added burdens on our seniors. One possible option, for example, is to raise the cap on the amount of income subject to the Social Security tax. If we kept the payroll tax rate exactly the same but applied it to all earnings and not just the first $97,500, we could virtually eliminate the entire Social Security shortfall. This seems to be a shift from his past statements and puts him closer to Senator Clinton. Under this plan, the top marginal tax rate (including federal income and payroll taxes, but not state taxes) would rise from 37.9 to 50.3 percent. To correctly count the employer's 7.65% of payroll taxes as a marginal tax (and it is), we have to also include it as income. Thus, for someone in the 35% tax bracket who earns an extra $1 in income, pays 7.65% in payroll taxes and whose employer pays 7.65% in payroll taxes, the true marginal tax rate is:(.35 + .0765 +.0765)/(1+.0765) = 46.7. I wouldn't want to pay 46.7% or 50.3% as a marginal tax, but we need to be honest on this issue. Social Security faces a shortfall over the indefinite future of $13.6 trillion in present value terms, an amount equal to 3.5 percent of future taxable payrolls. Looking at the gap over a shorter horizon provides only limited information on the financial status of the program. Social Security can be made permanently solvent only by reducing the present value of scheduled benefits and/or increasing the present value of scheduled tax revenues. Other changes to the program might be desirable, but only these changes can restore solvency permanently. Delaying changes to Social Security reduces the number of cohorts over which the burden of reform can be spread. Not taking action is thus unfair to future generations. This is a significant cost of delay. Of the two primary policies being proposed to address global warming—the capping and trading of emissions and the taxation of emissions—we favor the taxation of emissions. We suggest that a pro-active environmental policy should include an appropriate carbon tax fully offset by a static dollar-for-dollar across-the-board reduction in marginal income tax rates. If implemented with taxpayer protections, this policy would mitigate many if not all of the adverse economic costs from reducing carbon emissions. Larry makes the case for bailouts. This is a topic on which there is little consensus among professional economists. Larry represents the more activist point of view. A competent lender of last resort – in Bagehot’s sense of one who lends freely at a penalty rate against good collateral – actually turns a profit, as the IMF did in its response to the financial crises of the 1990s. An important corollary to recognizing that decisions are about probabilities is that decisions should not be judged by outcomes but by the quality of the decision-making, though outcomes are certainly one useful input in that evaluation.. Any individual decisions can be badly thought through, and yet be successful. That piece of wisdom, by the way, is from Robert Rubin. First, are there substantial contagion effects? Second, is the problem a liquidity problem where a contribution to stability can be provided with high probability or does it involve problems of solvency? Third, is it reasonable to expect that the action in question will not impose costs on taxpayers? If the answers to all three questions are affirmative, there is a strong case for public action. These questions are sensible, but they are hardly an algorithm for good policy. They are extraordinarily vague, leaving a lot of discretion to those in power. Bailout critics are skeptical that government policymakers are likely to have all the wisdom that Larry presumes. And they are skeptical that those who oversaw the "successful" bailouts of the 1990s were actually as wise as they think they were. After all, "individual decisions can be badly thought through, and yet be successful." Austan Goolsbee tells you how to sell your house. 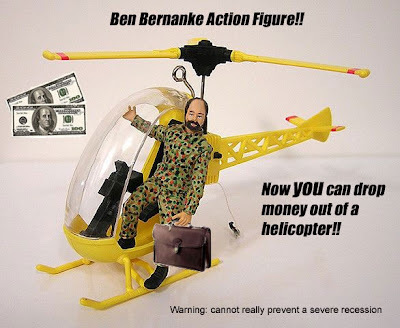 The "dropping money from a helicopter" thought experiment has become associated with Ben Bernanke, who once used it in a speech. But of course it was not original to him: The thought experiment is a very old one within monetary economics and is typically credited to Milton Friedman. Thanks to Luskin for the image. Free market economies succeed by virtue of competition. But what rules should govern that competition? A producer in a market can put another producer out of business by making a better product but not by burning down his factory. That much seems obvious. 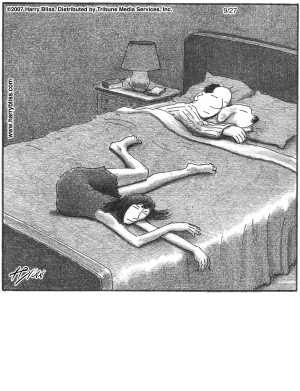 Sometimes, however, it is harder to determine what the rules should be. A fascinating example is unfolding at Harvard. The Coop is the university-affiliated bookstore, which stocks textbooks for courses (and I believe is run by Barnes and Noble). The store called the cops when some students who operate a bookselling website started copying down prices and ISBN numbers and then refused to leave when asked. Was the Coop in the right? After all, the Coop is private property, and perhaps it should be able to regulate behavior on its premises and exclude anyone it wants. On the other hand, the Coop opens itself to the public, and the students were only examining merchandise it was offering for sale. Which side would you take, if you were setting the rules of the game? I happened to notice that Kenneth Griffin is on the latest list of the Forbes 400 richest Americans with net worth of $3 billion (at age 38). Griffin was a graduate of Harvard College and, according to Wikipedia, an economics major. Yes, I know, the Harvard econ department does not deserve all the credit for Mr Griffin's success, but we will happily accept a small share of it. After all, our building does need renovation. Why do we have a Fed? Why do we have someone adjusting the rates if we’re a free-market society? Alan's answer is not satisfying, but I don't blame him: The economics profession does not have a good answer. We economists have rigorous and fundamental theory to explain why we have environmental regulation (externalities) and to explain why we have antitrust laws (market power), but there is no consensus about what market failure calls for the existence of a central bank. The answer has something to do with the benefits of a system of fiat money. And it has something to do with the possibility of short-run monetary nonneutrality (due to sticky prices and/or imperfect information about prices). But the precise combination of elements that would yield a satisfying answer is still elusive. Stewart stumbled upon a fundamental question of monetary economics. If anyone has a good answer, let me know, or publish it in the American Economic Review. Okay, you want to raise taxes on the rich. I get that. But what do you want to do with the money? Give a tax cut to the middle class. Reduce the long-term fiscal gap. To get some idea about the numbers involved here, let's turn to the Congressional Budget Office. The CBO tells us that each percentage-point increase in the top two income tax rates (singles making over about $150K, married taxpayers over about $180K) increases tax revenue by only about $6 billion a year. And even that $6 billion is an overestimate, because it takes into account only a limited range of behavioral responses to higher tax rates. No one really thinks you can achieve all three of the above goals in any significant degree and pay for them with only tax hikes on the rich. When it comes down to choosing among the three goals, which one would you pick? After nearly two years as your reader, you've pretty much singlehandedly made me a fiscal libertarian out of a former democratic socialist. My recommendation to members of Congress: No more press releases like this one. The last thing we need is the perception that the Fed is caving in to political pressure. Such a perception, even if unfounded, would raise inflation expectations and make the Fed's job even harder. By Robert E. Lucas, Jr. The need for a lender-of-last-resort function is one qualification to the discipline of inflation targeting, but it is a necessary one. There is a second line of argument that seems to me much less compelling. It starts with the fact that monetary policy necessarily affects future inflation rates, not the current rate: That has already been determined when the open market committee meets. We also know that whatever funds rate target is chosen, all kinds of others forces -- anything that happens to the real economy -- will affect next quarter's rate of inflation, or next year's. So we would like to forecast these other forces as well as possible and take them into account. There is nothing wrong with this logic, but how useful it is depends on how good we are at forecasting the non-monetary determinants of prices. In fact, inflation forecasting is notoriously one of the squishiest areas of economic statistics. In this situation, it is all too easy for easy money advocates to see a recession coming and rationalize low interest rates. They could be right -- who really knows? -- and in any case we may not know enough to prove them wrong. So I am skeptical about the argument that the subprime mortgage problem will contaminate the whole mortgage market, that housing construction will come to a halt, and that the economy will slip into a recession. Every step in this chain is questionable and none has been quantified. If we have learned anything from the past 20 years it is that there is a lot of stability built into the real economy. To me, inflation targeting at its best is an application of Milton Friedman's maxim that "inflation is always and everywhere a monetary phenomenon," and its corollary that monetary policy should concentrate on the one thing it can do well -- control inflation. It can be hard to keep this in mind in financially chaotic times, but I think it is worth a try. Glenn Hubbard and John Cogan want to bring the market to healthcare. Brookings economist Doug Elmendorf (who long ago was head section leader for ec 10) offers his Notes on Policy Responses to the Subprime Mortgage Unraveling. Thanks to Randall Parker (via the RTE blog). Allan Meltzer takes on Martin Feldstein and says the Fed should hold firm. institutions should empower graduating seniors to reward teaching excellence. Colleges should do this by giving each graduating senior $1,000 to distribute among their faculty. Newmark's Door worries that this would encourage inflated grades and dumbed down courses. Here's Alan Greenspan on the economy of the future. In today's NY Times, I make the case for a carbon tax. David Leonhardt gives a mixed review to Ian Ayres's new book Super Crunchers. If there is any place that should be open to a wide range of views, it is a university. To bar a scholar as prominent as Larry from talking simply because you disagree with him is despicable. Arnold Kling reveals his inner Hayek. A profile of public finance economist Raj Chetty. Economists Robin Hanson and David Cutler debate health care. Magnus Henrekson and Daniel Waldenström consider various ways of ranking academic economists. One tidbit from their table 4: The Spearman rank correlation between cites in Google-Scholar and cites in the Social Science Citation Index is 0.848. In other words, the newer Google-Scholar yields very similar conclusions to the more conventional source for citation data. Did you know that the average Fed Funds rate for August was 5.0%? That is, the Fed already cut rates by a quarter point--it just did not announce it. He is right: The intended Federal Funds rate is still at 5.25, but the actual rate was 5.02 in August. In the preceding 13 months, the Fed missed its target by no more than a single basis point. But then in August it misses by 23 basis points. Why? Is this an unannounced change in the target, or is the Fed getting worse at hitting its target? A causal relationship between gasoline prices and obesity is possible through mechanisms of increased exercise and decreased eating in restaurants. I use a fixed effects model to explore whether this theory has empirical support, finding that an additional $1 in real gasoline prices would reduce obesity in the U.S. by 15% after five years, and that 13% of the rise in obesity between 1979 and 2004 can be attributed to falling real gas prices during this period. What should the fed funds rate be? The time has come for the Federal Reserve to cut the federal funds interest rate substantially, starting on a path from the current 5.25% to 4.25% and possibly even less. My favorite equation for monetary policy predicts a somewhat smaller rate cut. I'm wondering what your reaction is to Ben's latest "global savings glut" speech. Ben's conjecture that real interest rates have fallen as a result of increased saving among emerging and oil producing countries seems plausible to me. What strikes me as off kilter, though, is the normative conclusion he draws, that the current account deficit therefore poses a problem of insufficient savings domestically. Arguments for insufficient saving often have as starting point myopic or otherwise irrational behavior by savers. But it's entirely rational for people to save less when real interest rates fall. If a global savings glut has driven down real rates, US savers are worse off as a result, but a policy response of encouraging more saving would only exacerbate the domestic welfare loss stemming from the glut. What, if anything, am I missing here? I agree that Ben has not fully spelled out his logic on this point. Even our current account deficit is the result of a "saving glut" abroad, that is no reason by itself that Americans should save more. Nonetheless, many economists agree with Ben's normative conclusion that U.S. national saving should increase. One might argue national saving is too low because the tax code discourages saving (as my colleague Martin Feldstein would emphasize), because people suffer from problems of self control (as my colleague David Laibson would emphasize), or because the U.S. government is not saving enough to deal with the coming entitlement crunch. My guess is that Ben would have sympathy for all three arguments. Thanks to Ron Cronovich for the pointer. The RTE blog reports that Martin Feldstein is stepping down as President of the NBER. Here is his resignation letter. Disclaimer: I have no knowledge about, or financial interest in, this supplier. A new working paper from economists Victor Lavy of Hebrew University and Analía Schlosser of Princeton attempts to unpick the peer effects associated with gender, using data on nearly half a million students passing through Israel's school system in the 1990s. They compared consecutive year groups passing through the same school, figuring that if one year's group was 55 percent boys and the next year's was 55 percent girls, that difference was very likely to be random and thus susceptible to meaningful number crunching. Their answer chimes perfectly with the conventional wisdom: Boys benefit from being in a classroom with girls, but girls do not benefit from being in a classroom with boys. Sen. Hillary Rodham Clinton told an AARP convention that, as president, she would move quickly to fix Social Security's long-term finances, but that cutting benefits or raising the eligibility age would be "off the table." That would leave only higher payroll taxes as a solution, most experts say. The New York Democrat's comments, made in Boston on Friday, were a further effort to draw distinctions with her chief rival for her party's presidential nomination, Illinois Sen. Barack Obama. In May, Mr. Obama said that "everything should be on the table," including benefits and taxes. Recall that 77.2 percent of economists agree that "the best way to deal with Social Security's long-term funding gap is to increase the normal retirement age." Don't Drink the CAFE Kool-Aid. According to the betting over at intrade, the probability of a recession in 2008 is now greater than 50 percent. Sensible solutions to the lending mess, according to my Harvard colleague Ed Glaeser. At a conference dinner last night, a prominent economist posed the following puzzle: Over the past month, the Fed funds rate is unchanged (and is expected to fall), the discount rate is down, and the Treasury bill rate is down, but the LIBOR rate is up. Why? A related question: We usually evaluate the stance of monetary policy with the Fed funds rate. But when LIBOR and Fed funds become unhinged, as they seem to be now, on what basis are we to choose between them? No definitive resolutions were offered. Post your answers in the comments section. In Current Biology, a zoologist says it is misguided to evaluate scientists by counting their citations. Fortunately, we economists would never make that mistake. Consider: From 1990 to 2006, the number of poor Hispanics increased 3.2 million, from 6 million to 9.2 million. Meanwhile, the number of non-Hispanic whites in poverty fell from 16.6 million (poverty rate: 8.8 percent) in 1990 to 16 million (8.2 percent) in 2006. Among blacks, there was a decline from 9.8 million in 1990 (poverty rate: 31.9 percent) to 9 million (24.3 percent) in 2006. White and black poverty has risen somewhat since 2000 but is down over longer periods. Only an act of willful denial can separate immigration and poverty. The increase among Hispanics must be concentrated among immigrants, legal and illegal, as well as their American-born children. Yet, this story goes largely untold. Of course, many of these poor immigrants are nonetheless richer than they were in their country of origin. I wonder: How much has immigration, via this direct change in the population distribution, affected statistics like median household income? A profile of my Harvard colleague Robert Barro. Bloomberg reports that the prominent economist and policymaker Ned Gramlich has died. ...for defending Glenn and me. In today's NY Times, David Leonhardt tells us what John Dingell is really up to. At a recent GMU lunch, two economists sparred over the optimal quantity of cash to keep in one's wallet. Economist A holds very little cash, on the grounds that you can pay for virtually everything with credit cards. Economist B holds lots of cash, on the grounds that the foregone interest is virtually nothing, and his time is very valuable. Whose side do you take, and why? Value of time and foregone interest calculations are welcome. Bryan dismisses the textbook model too quickly. The standard Baumol-Tobin model of cash management gives more than a general framework: It yields a concrete answer. A problem in chapter 18 of my intermediate macro textbook asks the student to apply the model to a simple numerical example describing his or her own behavior. Most people hold much less money on average and go to the ATM much more often than the model predicts for their parameter values. This is a puzzle. It is also a great example to work through in an intermediate macro class. You can generate a good classroom discussion about why the model fails to match behavior. One possible answer is that people are worried about losing the money. A probability p of loss or theft would affect the opportunity cost of holding cash and thus effectively raise the interest rate that enters the model to r+p. But plugging in numbers makes this a hard case to make. To match behavior, such as a biweekly trip to the ATM, you would need people to lose their wallets far more often than they do. Many students will then say that they don't hold as much cash as the model predicts because they are afraid they will spend it. This response raises an intriguing behavioral theory: Money burns a hole in your pocket, but the temptation is somehow removed if the money is left at the bank. I don't find this very compelling as a description of my own behavior, but my experience is that many students are more attracted to it. In a sense, a central bank's relationship with asset markets is like that of a man who claims he is going to the ballet to make himself happy, not to make his wife happy. But then he sheepishly adds that if his wife is not happy, he cannot be happy. If you are a new econ PhD on the job market this year, this rumor mill will help you find and share information (and reach the requisite level of anxiety). Print a lot of money, control prices and wages, and then watch the laws of economics take over. House Prices in the Taylor Rule? Central bankers should ease monetary policy quickly and aggressively in response to a big fall in house prices, Federal Reserve governor Frederic Mishkin said on Saturday. He said the optimal policy response was both quicker and more aggressive than that suggested by a standard policy rule, in which policymakers respond only to deviations in output and inflation. He said simulations show that this approach “can be very successful at counteracting the real effects” of even a large house price slump, because of the long lags from changes in housing wealth to changes in consumer spending. Update: Here is the Mishkin paper. tickets were issued more often in places that were short on cash, and out-of-towners received tickets more often than drivers with local addresses. To prevent lending institutions from offering misleading deals that trap borrowers, we should require that all future mortgage loans be prepayable with no penalty. This is an easy, simple rule. The rule will have the effect of leading banks to stop offering many of the teaser rates that serve as loss leaders (pay too little interest for the first 18 months but then pay extra on the back end). These loss leaders are often confusing and tempting for borrowers. Banks won't want to offer loss leaders if borrowers can get out of the loan without paying a penalty after the subsidized payment period -- the teaser period -- ends. My proposal would not discourage banks from offering sensible adjustable rate mortgages (those without a loss leader component). Borrowers should be allowed to take out a mortgage pegged to short-term rates. That's not a loss leader and such mortgages will still be offered if prepayment is made penalty-free. My proposal will only hit the mortgages with early loss leaders built into the payment stream. I appreciate the logic here. When I refinanced my mortgage not long ago, one of my first questions was, Are there any prepayment penalties? I figured that as long as the answer was no, I was less likely to be hit with strange, hidden provisions down the road.